It took 23-years, but gamers outside of Japan finally have easy and inexpensive access to the all time great arcade classic Windjammers at home. Yes, I’m ignoring the Neo Geo home systems because “easy access” and “inexpensive” are pretty much the opposite of the Neo Geo. Thanks to the wonderful folks at DotEmu, you can now own Windjammers on PS4 and Vita for the low price of $15 and I’m happy to say that this port is everything fans have been waiting for. Continue reading our full Windjammers PS4 review for all of the details. 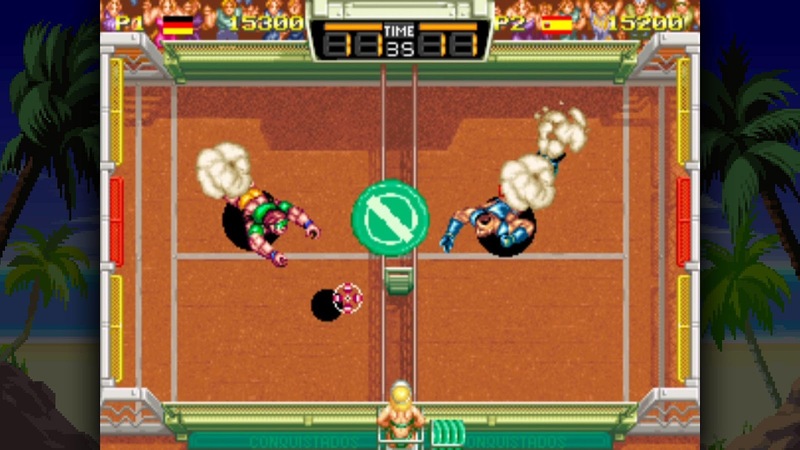 Back in the 90’s when arcades – with real games, not whatever the heck those things are they’re calling arcade games these days – were still a thing, Windjammers was an ever-present fixture in the game lineup. In my small town arcade Windjammers never got taken out of the four slot Neo Geo machine even while the other slots regularly rotated in new titles. It really was that popular. And for good reason – Windjammers rocks. 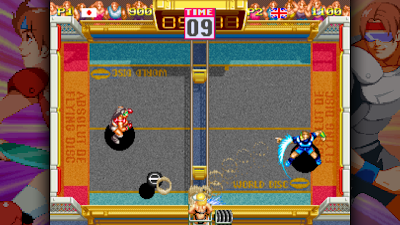 Windjammers is a sort of Frisbee / soccer hybrid crossed with a fighting game. Matches take place in closed arenas of varying sizes – some with obstacles – and the idea is to throw the disc past your opponent into their end zone to score points. Points are awarded for 3 or 5 points, depending on where the disc goes into the goal, and 2 points are awarded for any dropped discs. The first player to 12 points wins that round and matches are best two of three. What makes Windjammers so fun is how strategic it is. Each of the six playable characters has different movement and throwing speeds along with unique special moves. As mentioned above, each arena is also slightly different with some putting obstacles on the net that you can use to ricochet the disc around at new angles. By using different techniques when you receive a disc – such as popping it up in the air to charge up a super move or pressing the throw button the instant you catch it to return it at super speed – you have a surprising amount of control over how you throw and where it goes and how your opponent has to react. 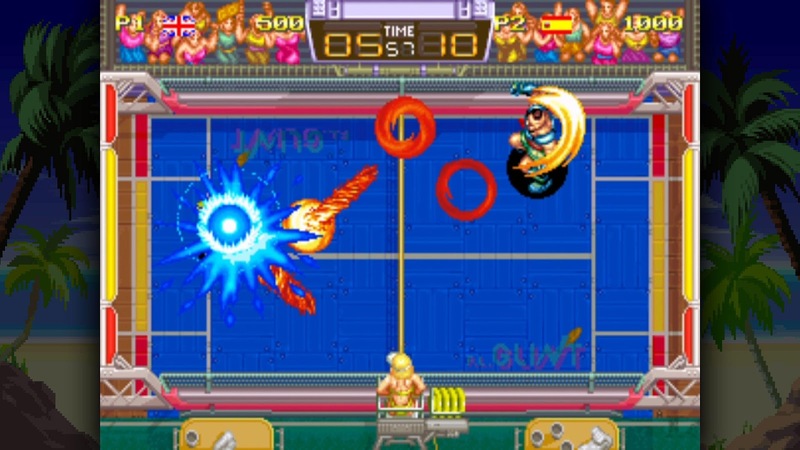 Whiile there is a surprising amount of strategy in Windjammers it doesn't have a lot of depth, however, as there are only a handful of moves and techniques to use at a given time. It can become a bit shallow and repetitive after a while, particularly when playing against the A.I.. The new PS4 / Vita release of Windjammers lets you play against the A.I. across three difficulty levels, but the real appeal comes from playing multiplayer. Either online or locally, Windjammers really shines when you play competitively against a real person. The shallowness of the game isn’t as apparent when playing against unpredictable humans as it is when playing the A.I., so you can have some really spectacular multiplayer matches that really show off why Windjammers was, and is, a fan favorite. Rounding out the features list is the option to play the two mini-games – throwing a Frisbee to a dog along a crowded beach as well as bowling – any time you want. The presentation in Windjammers is pretty much pixel perfect. It’s just like you remember it with all of the style and flash it had back in the arcades. It’s full of bright colors, a fun beach motif, and just screams “the 90’s”. You have some modern options, too, to stretch it to widescreen and use different filters to smooth it our or give it that classic CRT look. The game runs at a very smooth framerate, so no issues there. All in all, I’m really glad Windjammers finally got a home release I can actually play. The game is incredibly fun and the port was exceptionally well done. For the $15 asking price it’s pretty much a no-brainer, especially if you are going to play multiplayer. Windjammers is great. Buy it.